Manchester United managed to salvage a draw against the ever-growing force that is Chelsea Football Club. A 94th minute goal from Robin van Persie, ensured that the Red Devils took a point off the runaway leaders, and didn’t harm their already tarnished reputation some more. Chelsea arrived at Old Trafford with an almost perfect record in the Premier League (only failing to win at the Etihad) whereas United’s form has been up and down like a yo-yo. Many expected the free scoring Chelsea (24 goals in the league) to tear the fragile defense of Man United to pieces (13 conceded, most out of the top 8). However the Old Trafford faithful had other ideas. Diego Costa, Radamel Falcao and Phil Jones were all absent for their respected teams, and this was telling at times for both teams. United brought in the out of favor and out of form Chris Smalling to replace the injured Jones, but it has to be said, Smalling had the game of his life. 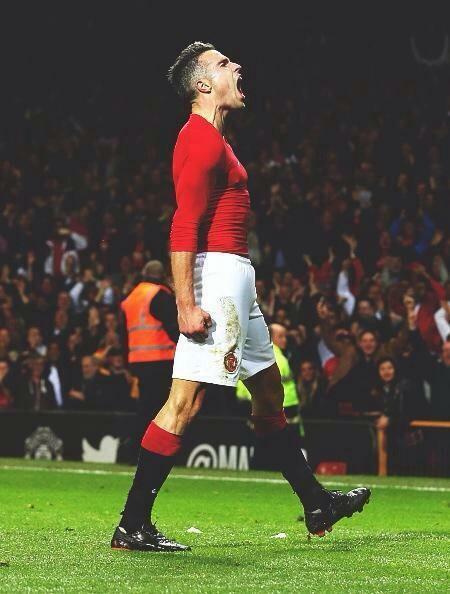 For the first time since maybe his arrival to United in 2010, the 24-year-old actually looked confident on the ball. Nor he or anyone else in the United back line was perfect, but it has to be said that Chris Smalling put in a good performance when it was required. After David De Gea preformed some more heroics to deny Eden Hazard, a Fabregas corner was met by the head of the Chelsea legend Didier Drogba, and the Blues were now 0-1 up. Jose Mourinho then decided to bring on the human full-time whistle Mikel, Kurt Zouma and Andre Schurlle to make sure his team left Old Trafford with all three points. The 13 time Premier League champions had looked threatening all game (19 shots, 7 on target) but with Mourinho deciding to park his infamous bus in the middle of the Old Trafford pitch, it didn’t look as if United would get anything out of this game. Branislav Ivanovic was a key figure in this match. Early in the game he was caught in what looked a headlock and dragged to the ground by Chris Smalling in the Man United penalty area, nothing was given from referee Phil Dowd who had a really poor game. Ivanovic was booked in the 65th minute of the match for a foul on Di Maria, before the two had a coming together just under half an hour later, which saw Ivanovic receive a second yellow card and thus a sending off. Di Maria puts the ball down in front of the Stretford End, preparing himself for a last-minute free kick into the Chelsea penalty area.The Argentinian delivers his best set piece of the match, and it’s met by the head of Marouane Fellaini who is denied by a brilliant save from Courtois (who was solid throughout the match). Fortunately for United though, Robin van Persie found his shooting boots and rifles home the rebound to send Manchester United fans all over the world into rapturous delight. The goal coming so late in the game sent United fans on a trip down memory lane, that late goal feeling had returned to the Theatre of Dreams. When the goal went in it certainly felt like a win, but the reality is it’s only a draw. If the likes of Januzaj, Mata, Fellaini and Robin van Persie had taken their chances, then United could have beaten Chelsea. On the contrary, Chelsea were dealt a huge injustice when Phil Dowd failed to give the league leaders a clear penalty which would have put them ahead earlier on in the match. So all in all, a draw may be considered as the correct result rather than the fairest. In a game in which many expected United to be slaughtered in, the draw will give the red devils a lot of much-needed confidence going into the game against the champions next Sunday. With City losing away at West Ham, the Manchester derby is yet again a must watch match with both teams in desperate need for three points.